…That was some months ago. As we arrive at the eve of probably the biggest football match on the planet, known for the intense rivalry between both sets of fans and players, it’s only logical to go back and revisit the post match comments and compare them with the pre match comments of the upcoming El Clasico. …The difference in the tone of the comments is very perceptible. From self-proclaimed winners back to title contenders under serious pressure, the mood of Barcelona has been akin to that of having a saving account of pressure, where more and more pressure has been deposited by their friendly neighborhood rivals since the dawn of the new quarter. On the other hand, for Real Madrid, the journey has been pretty much stable. No one expects them to win anyway, and yet winning is probably the only thing they’ve been doing amidst healthy doses of Capello now and then. Twelve points in December 2008. Four points in April 2009. The ferocious tenacity shown by Madrid in chipping away the huge point deficit has been really commendable, even though their style of play hasn’t. Games like this, the one against Sevilla, the one against Getafe define how a season ends and Madrid has surely come out tops over Barcelona in that aspect. Juande Ramos has a lot of plaudits under his belt. He’s one of the reputed coaches around, inspite of his disaster of a season with Spurs. His achievements in Spain cannot be forgotten though. He is the coach responsible for taking a modest Sevilla outfit to one of the potential title contenders grabbing two consecutive UEFA Cups on the way, making them a force to be reckoned with in Europe as well. What counts against him is the fact that the injury prone Madrid squad is also not balanced with too many reinforcements in one area and none in the other. On the other hand, Pep Guardiola is the rookie having no silverware under his belt. What he has on his side though is a motivated squad with all the players having hit top form simultaneously; not to mention the fat cash incentives that the Barca management has promised him in his contract for each of the silverware he wins. The last time these two went head to head was on December 13 last year. Ramos had barely one training session to assess his team before rolling the players out in Camp Nou. On the other hand, Pep had a team which was demolishing every team they played in excess of 3 goals scored and none conceded. On May 2, Ramos will go into the Clasico on the back of a record breaking unbeaten streak for Real Madrid. 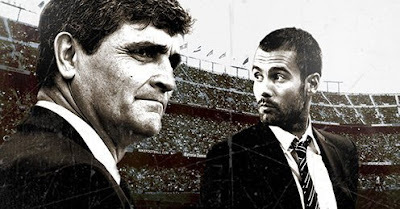 Pep will go into the Clasico having a highly motivated and treble dreaming, albeit fatigued squad. It would be interesting to see how these two lay out their pawns on the green chess set of the Bernabeu. Real Madrid received a lot of criticism from Catalunya and football purists for their ultra conservative approach towards the match they last played. Some sects of fans in Barcelona went as far as labeling them as “Barbarians” for marking Xavi out of the game and the tactical fouling on Messi. Madridista retaliated by branding Barcelona as “Ballerinas”, for being so delicate that they took offence to physical contact in a contact sport. And they did have a case. A footballer knows how to get a player injured and set back home. But all the fouls on Messi were directed at his shins where there is protection. It was a desperate tactic; albeit a very ugly one, employed by a team clutching at straws to try and disrupt the Barca attacking flow and their mentality so that their concentration was disturbed. The tactic did pay dividends as Barca was unable to score till the 83rd minute with Iker Casillas grinding out one of his best performances in a Madrid jersey. Only days ago, Valencia demonstrated that the mighty Barca can be halted by using a modified version of the tactic Madrid employed and last night Chelsea used the tactic to hold Barca to a goalless draw at the Camp Nou. That is evidence to show that Barcelona are indeed the Ballerinas of football. Exquisite, attractive, but shy at physical contact. Pep doesn’t seem to have too much tactical initiative when posed with a team which disrupts their normal style of play, and this chink in armor could b exploited to devastating effect by Madrid. On the other hand, Madrid with their defensive frailities in big matches (2 goals against Athletico, 5 against Liverpool, 2 against Sevilla) could be exploited if they allow Barcelona into the game. The key to this encounter for both teams would be to simply continue what they’ve been doing and how they’ve been playing. Any deviation from the normal would spell doom. So, its back to Barbarians vs Ballerinas? That remains to be seen. Madrid have an advantage of playing the reverse leg at their fortress, the Santiago Bernabeu, where in inspite of their disaster of a seaon, they can boast of the best win record of this season for any club, and the better win record against Barcelona. To make matters worse for Barcelona, only 800 tickets have been granted to Barcelona to be distributed amongst their travelling fans. And if this was not enough, a giant white mosaic has been prepared by the club fans to intimidate Barcelona. Each fan will find posters on their seat, which when raised simultaneously will blanket the stadium white. 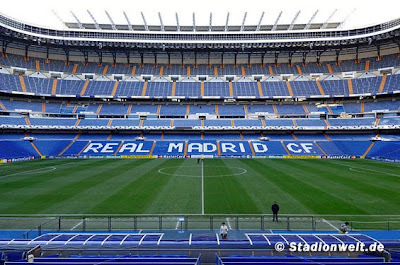 The expected attendance at the Bernabeu is 80,000 which means a sell-out. Barbarians or Ballerinas, this colossal event guarantees to be a sell-out worldwide; something every football fan will tune into for. Good post mate, i especially liked the Tactician Vs the prodigy part, good work. 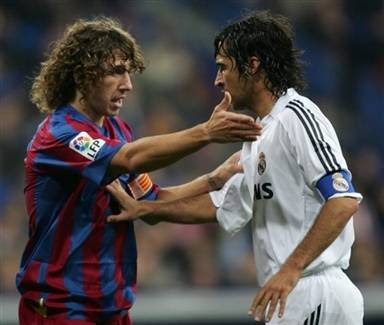 As for the Clasico its self i think we`re gonna be in store for a good game. Madrid with the necessity to win and Barça who are coming from a tough midweek CL encounter that would consider a draw as a great result, at least i would. Madrid`s necessity and urgency to win could work against them, i am very interested to see how Juande approaches this game and how the players interpret the game. If its an open head on battle then great for us and for the spectators but i have a feeling Juande may want to close the game down, time will tell. A Nice post. Barcelona has been caught napping a few times this season. First it was Real and Espanyol with emphasis on defense and not letting Barcelona settle and then it was Atletico who took the game to Barca with blistering attack from the word go. From these tactics one this is clear (i.e) Barca seem to suffer lapse of form and strength to win matches when their natural rhythm and flair bought to halt. Good post mate. I am feeling very optimistic about this game unlike the Clasico in December and we should make it at the Bernabeu'. good post ashay , Only 800 cules in the bernabeau? That is going to be hard for the catalans with the fans erupting for each and every second of our possession. BOCA JUNIORS, VALDEBEBAS 2 ?